After her husband suddenly disappears one night, Audrey starts to desperately search the town for information about him, finding a series of anonymous letters with cryptic clues leading to a greater mystery. 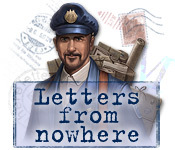 Letters from Nowhere is a straightforward hidden object game, where the player has to find and click on all the items listed at the bottom of the screen on locations filled with assorted paraphernalia scattered around the scenery. Some of the list entries show riddles about the object instead of its name. Optionally, three stamps have to be collected on each scene to unlock the unlimited mode, where previous locations are revisited and the goal is to find every single object appearing on the screen. Combo points are received after quickly finding objects in succession. Every location has one special object that needs to be assembled, by dragging and dropping two pieces or components on top of each other. The hint button is a large magnifying glass at the bottom-right corner, showing the position of one of the required items when activated, but taking some time to recharge after use. Four helpful items can be bought with the accumulated points on the map screen between locations, afterwards appearing on all scenes: a jack-in-the-box that pops open and gives bonus points; a thermometer that replaces the cursor for a few minutes, becoming frozen when moved away from the listed objects, getting hotter and finally burning brightly when approaching one of the required items; a Polaroid camera that turns the screen white with a flash, showing images of several objects at once for a few seconds, with each photo positioned over its subject; and a painter's palette that replaces the words in the list with a series of images. Mini-games take place on a separate screen, usually appearing after finding a related object, where the player has to reassemble torn pictures, flip tiles in a memory game to find pairs of matching runes, match zodiac symbols with drawings depicting their signs and complete other similar challenges.